Summary : If you enjoy walking at night or want to easily find your dog at the campsite, the Nite Beams LED Leash works perfectly. We have been using the Nite Beams LED Pet leash for quite some time now and have been impressed. Since our dog is a part of our family, they naturally go camping with us. 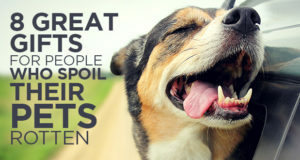 But just like kids there are quite a few things to think about before bringing your 4-legged friend with you for the week. They are going to be outside with you during the day and at night. It is usually pretty easy to spot them during the day but night time is a different story. We have had a few minor heart attacks thinking the dog got lose in our pitch black campsite. That panic can be alleviated with the Nite Beams LED Pet Leash. Appearance:The Nite Beams LED Pet leash is a neon green color with a reflective strip down the middle for extra light generation. The middle part of the leash is where the green LED lights are stored, tucked in the middle of 2 pieces of heavy duty nylon. We were impressed right of the bat by just how bright the green LED’s are in the dead of night. It provides instant visibility, a 1/4 mile of visibility to be exact. The handle was very comfortable in our hands with no real pressure points. That is a good thing if you have a large dog trying to pull your arm out of your socket on your walk. Ease Of Use:This LED leash is not very complicated and we like that. There are 3 pieces to it: the handle with a metal pivot point, the middle with the LED’s and the small piece that latches on to a collar. The LED piece is what interested us the most. In this middle section is a small switch that houses the battery and the on/off switch. 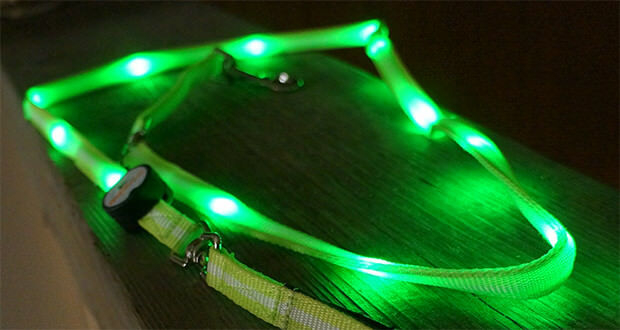 To turn the LED leash on, just push the button and the green LED’s light up instantly. One more push of the button and the green LED’s will flash. This could be great in a high traffic area where you want to make sure you are being spotted. 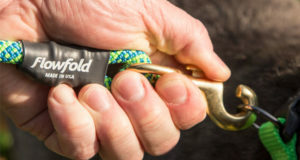 Durability:We have been using this leash for our evening walks and on our last few camping trips and have had no issues with LED’s, snaps or the ON/OFF button. When we’re at the campsite we tie are dog up to a stick in the ground and attach the leash to that. As much as our dog has managed to get itself tangled the leash has held up. It is amazing the difference this leash makes when doing a quick scan of where the dog is at when night falls on the campsite. We have been impressed with the quality of the nylon, the casing of the battery and ON/OFF button and the large clasp that hooks to our dogs collar. Value:For $30 we think the Nite Beams LED Pet Leash is a steal. If you head to your local pet store, most leashes range from at least $15 to well over $40. None of these have LED lights built in for night time use. This is an every day use leash whether it’s daylight or nighttime. With that much quality use out of it, we highly suggest picking one up.